Tokyo's Sembikiya looks like a jewelry shop. Harry & David need to step up their game. This is a luxury fruit parlor in Tokyo. It is the flagship store of the Sembikiya fruit emporium. 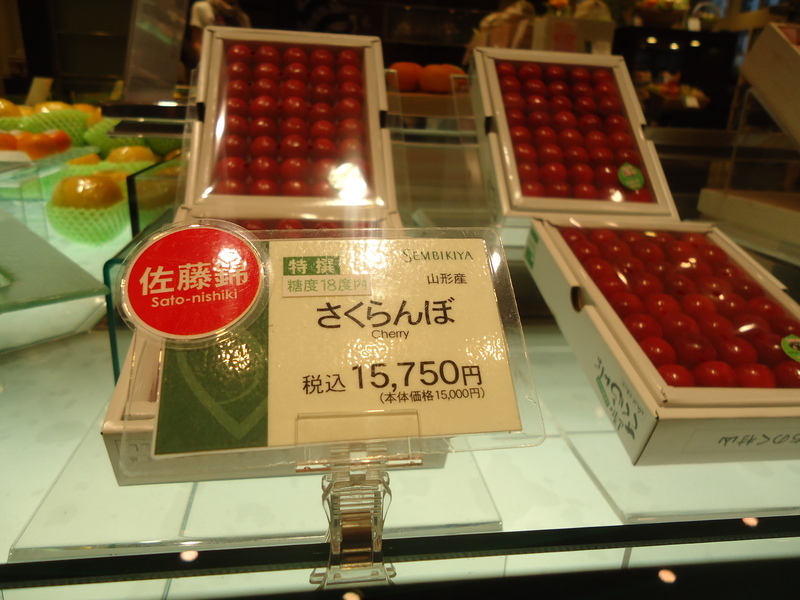 Run by the same Samurai-descendant family since 1834, Sembikiya began as a discount fruit store. But the wife of the second-generation owner decided they could make more money the other way around. But it is not actually a grocery store. It is a gift shop. 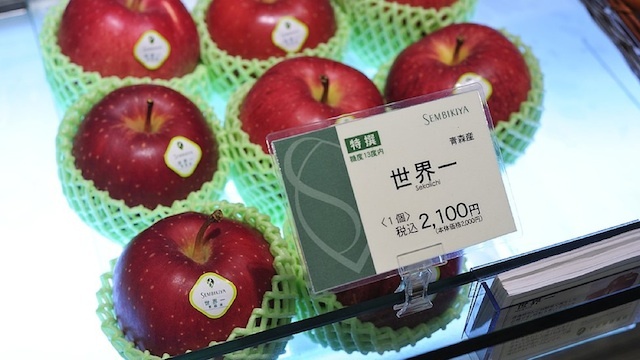 Sembikiya management estimates that 80-90 percent of their products are bought as gifts as it's customary in Japan to give high-end fruits as presents for formal occasions like weddings, business transactions, and hospital visits. What you can buy here: $21 "Sekai-ichi" apples. This would be an expensive 12-piece sushi meal even at a world-class restaurant. Or maybe you'd prefer a medly of 6 fruits for $170. Or $127 for a Densuke watermelon. As recently as 2011, Hokkaido farmers mourned the steep price drop for these stripeless watermelons, with the top crop of the season "only" auctioning for $4,000. Only 100 of these watermelons are grown each year in Hokkaido. They are the most expensive fruits on earth. A melon once auctioned for $23,500. What's so special about these cantaloups? For one, they're grown in perfectly weathered greenhouses and given hats to prevent sun burn. Each plant only grows one fruit, to receive the whole plant's sweetness -- farmers prune the less perfect fruits early on. So how did fruit become a luxury gift item? According to research by Takasago, an international flavor and fragrance company based in Japan, fruit as a luxury item stems from the fact that vegetables were always plentiful in Japanese agriculture, meaning fruit was not essential for nutrition. In Europe, where Western culture originated, much of the water is hard water, which is difficult to drink, and few crops could provide a source of vitamins throughout the year, so fruits, which were rich in water content and vitamins, were considered essential food in people's lives. Fruits were also the main type of preserved foods, being used for jams, juices, wines, and more. In contrast, Japan has a lot of rain, good quality water, and the availability of an abundance of vegetables and edible wild plants year round, from which water content and vitamins can easily be obtained. For this reason fruits were always considered luxury items and gift items. The Sembikiya family claims responsibility for helping start the tradition of fruit gift giving decades ago. And that's partially true: Because there's a market for fruit as a high-end gift, farmers go to extreme measures to highten the fruits flavor and to ensure a blemishless presentation: Orchards are hand-pollinated with tiny wands, fruits are given individual protective boxes to grow in, and apples are branded by stencil. And that is why there are fruit museums under every department store in Tokyo, where perfect melons probably sit behind velvet ropes and bulletproof glass.